It is the first of the quarter-finals and two student teams fight it out to reach the next stage of the competition. Jeremy Paxman asks the questions. 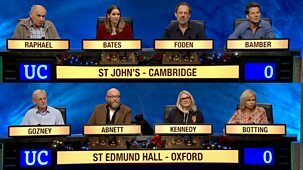 Find out which of the two teams competing in the second round of the student quiz will make it through to the quarter-finals.\n\nJeremy Paxman asks the questions. 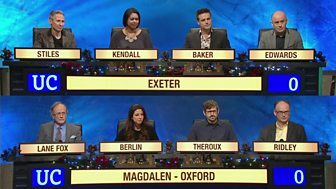 It is the first of the semi-finals in the University Challenge Christmas quiz for grown-ups.\n\nJeremy Paxman asks the questions. 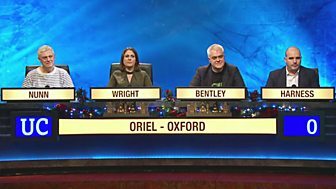 It is the second of the semi-finals in the University Challenge quiz for grown-ups.\n\nJeremy Paxman asks the questions. 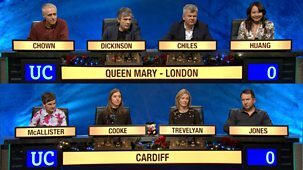 It is the first of the semi-finals in the University Challenge quiz for grown-ups.\n\nJeremy Paxman asks the questions. In the second round stage of the competition for students, two more teams do battle to reach the quarter-finals. Jeremy Paxman asks the questions. Series featuring teams of distinguished graduates. 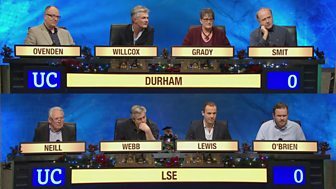 The last of the semi final matches in the University Challenge Christmas quiz for grown-ups. Jeremy Paxman asks the questions. Series featuring distinguished graduates. The first of the semi-final matches featuring special guests who are graduates from two of the UK's top universities. The second round continues as two student teams make a bid to reach the quarter-final stage of the competition. Jeremy Paxman asks the questions. In another second-round match, two teams fight it out for a place in the quarter-finals. Jeremy Paxman asks the questions. It is the first of the second-round matches as two teams battle it out for a place in the quarter-finals. Jeremy Paxman asks the questions. It is the last of the two highest-scoring loser matches as two teams get another chance to make it to the second round. Jeremy Paxman asks the questions. In the last of the first-round matches, the students of Keble College, Oxford, fight it out against the University of East Anglia. Jeremy Paxman asks the questions. In the penultimate first round match of the student quiz, the University of East London clashes with Manchester University. Jeremy Paxman asks the questions. It is a contest between UCL and King's College, London, for a place in the second round of the student quiz. Jeremy Paxman asks the questions. In another first-round match the students from St Peter's College, Oxford, fight it out against the team from Pembroke College, Cambridge. Jeremy Paxman asks the questions. 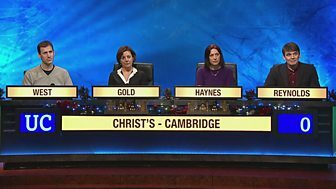 Students representing Clare College, Cambridge, compete with Hertford College, Oxford, in another first-round match.\n\nJeremy Paxman asks the questions. It's the grand final of the quiz for students, when the winning team will be presented with the University Challenge trophy. Jeremy Paxman asks the questions. It is the penultimate quarter-final match in the long and winding road to the semi-finals of the quiz for students. Jeremy Paxman asks the questions. In another quarter-final match two teams of students aim to reach the next stage of the quiz. Jeremy Paxman asks the questions. 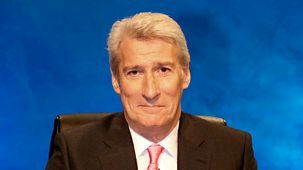 The quarter-finals continue when two teams of university students do battle to reach the next stage in the competition.\n\nJeremy Paxman asks the questions. 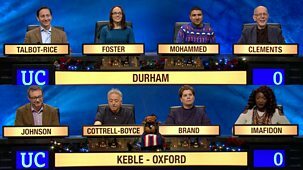 It is the first of the quarter-finals when two student teams fight it out to reach the next stage of the competition.\n\nJeremy Paxman asks the questions. It is the second of the semi-finals in the University Challenge quiz for grown-ups. Jeremy Paxman asks the questions. 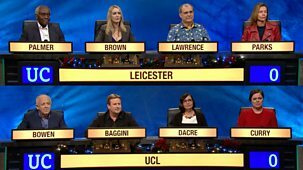 Second semi-final in the University Challenge Christmas quiz for grown-ups. Jeremy Paxman asks the questions. 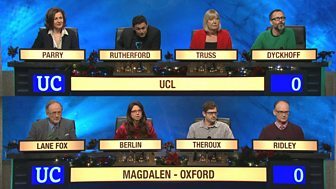 It is the first of the semi-finals in the University Challenge Christmas quiz for grown-ups. Jeremy Paxman asks the questions. In the next of the second-round matches, another two teams battle it out for a place in the quarter-finals. Jeremy Paxman asks the questions. It is the first of the second-round matches when two teams battle it out for a place in the quarter-finals. Jeremy Paxman asks the questions.